Apollo 11 moonwalker Buzz Aldrin is depicted in the eye of a needle, a work of art by sculptor, Willard Wigan. The first steps by Apollo 11 astronauts on moon in 1969 may have marked a giant leap for mankind, but one artist has recreated the colossal space exploration achievement in a statue so small, it fits inside the eye of a needle. The ultra-tiny artwork, created by British sculptor Willard Wigan, depicts Apollo 11 moonwalker Buzz Aldrin and is part of a collection of pieces described by many as the "eighth wonder of the world." The Buzz Aldrin figurine is on display in the San Diego Air & Space Museum Museum’s Ripley’s Believe It or Not! exhibition. Wigan, who hails from Birmingham, England, has made a career or creating unique, micro-pieces so minuscule that they are only visible through a microscope. He is scheduled to give a presentation on his work today (Feb. 25) at the San Diego Air & Space Museum’s Pavilion of Flight. 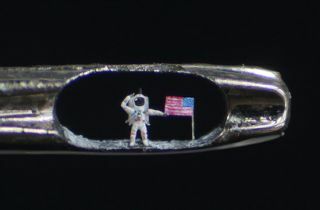 Artist Willard Wigan is creator of ultra-tiny works of art, including a diminutive statue of Apollo 11 Buzz Aldrin on the moon, set inside the eye of a needle. A visit to Wigan's website gallery showcases a variety of sculptures, from Humpty Dumpty, the Olympic torch, a coronation crown, a hummingbird to a Harley motorcycle and a couple engaged in the tango. "It began when I was 5 years old," Willard said. "I started making houses for ants because I thought they needed somewhere to live. Then I made them shoes and hats. It was a fantasy world I escaped to. That’s how my career as a micro-sculptor began." Wigan and his works resulted in him being honored by Her Majesty Queen Elizabeth II with a Member of the Most Excellent Order of the British Empire (MBE) for his services to art, which was presented by His Royal Highness, Prince Charles in July 2007. During a visit to the Conan TV show in November of last year, Wigan explained that within his toolkit to craft his works of art are shards of diamonds, as well as a hair of a dead fly to paint his masterpieces. Wigan takes months to complete a single sculpture, and has to slow his heartbeat and breathing to a near trance-like state to carve his works of art. In doing so, his slowed pulse actually creates the impulse he uses to chisel out his artwork. "It's a nightmare when I start … a dream when I finish," Wigan told comedian Conan O’Brien.